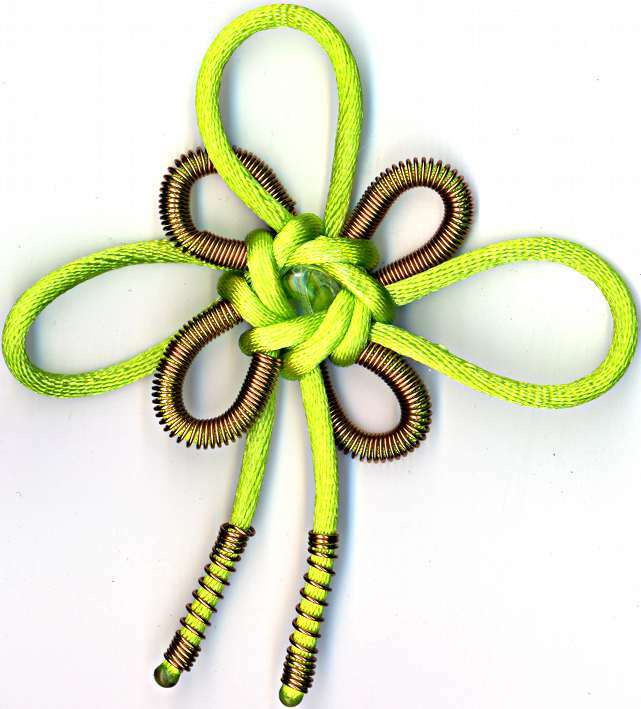 The base knot is a simple, standard octagonal flower (overlap of 3) in 3mm nylon satin cord (rattail). Every other loop has a coil of 18ga copper wire on it, approximately 3cm or so. To get a mandrel for my wire coiling, I looked to my local yarn shops and knitting needles. A #3 Japanese needle, a size 2 1/2 US needle, or size 11 Canadian/UK needle will be 3mm. I found that if I wound the cord around my hand 8 times, the working length ended pretty much perfectly. Obviously, your hand size will have something to do with how this advice works for you. Thread on 4 coils of wire and tie the knot. 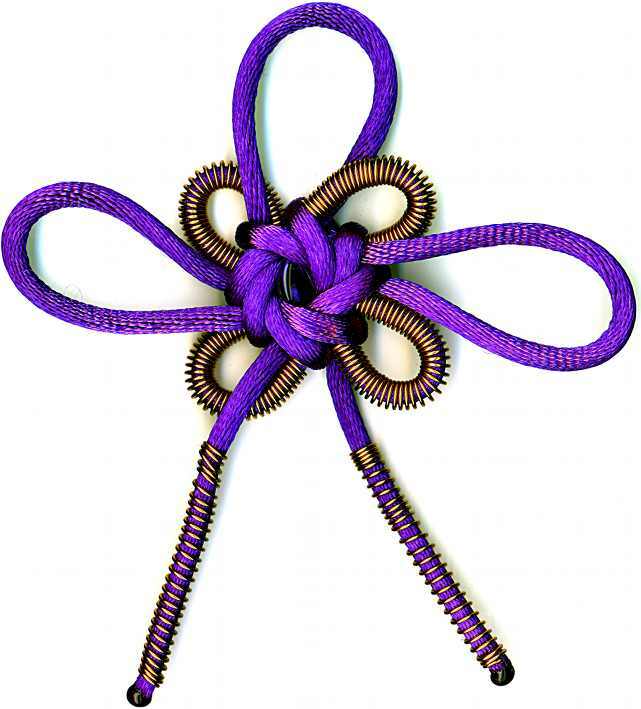 In this configuration, only one coil needs to actually go through the structural part of the knot while it's being tied. The others just sit on the ears and don't have to be worked through anything else. Do a first stage tightening of the knot (structural only), then thread the centre bead on a wire, expand the centre of the knot to accomodate the bead and thread the wire through the knot being careful not to tangle the wire in or through any of the fibres of the cord. Next you will be tightening again, this time bringing the ears down to their final size. While the knot is being tightened, the wire coils will need to go from straight to curved. It is helpful to "break" them first by bending them first over something like a pen, pencil or your finger. It doesn't always happen, but if you don't ease into bending the coil, it can "break" at a sharp angle (one bend of the wire deforms disproportionately to the rest of the coil giving it an angular appearance) which is unpleasant to fix. I found that I have almost no trouble with cut wire ends getting in the way of the tightening process. Just lucky? As I was doing the final tightening, I moved the cord back through the knot so that I only had to cut one end (longer leftovers == good). After tightening, I cut off the ends of the wire on the bead and curved the short ends under the ear coils. They hid very nicely. Lastly thread on coils to the loose ends of the knot, carefully melt the ends to have a nice big blob that won't go through the coils, stretch the coils if so desired, bend and bury the ends of the wire into the cord and you're done.